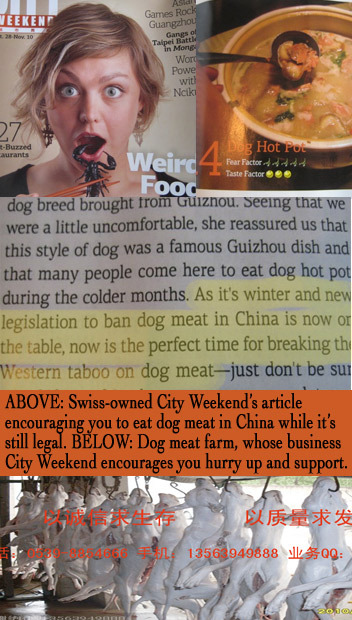 I was so shocked to hear that your Magazine “City Weekend” published an article that promote dog meat eating in China. I originally adored your magazine, though I am not one of the expats who are your targeted readers. However, my heart was broken by what your editors and writers did. 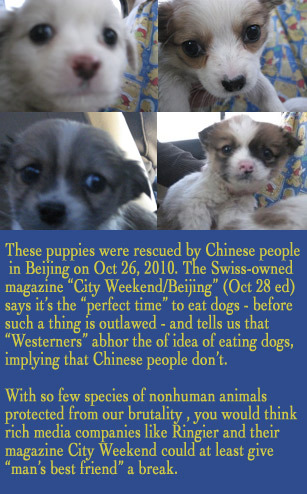 Just like many other animal lovers in China, I believed that the western expats are more educated and decent especially in terms of treating companion animals. Therefore we are desperately hoping the nice people from western countries to set up as good role models for our fellow people. Unfortunately your magazine implied that our expectation is but an illusion. I feel very disheartened about what your writers did. The dog meat industry is horribly cruel, and the sellers and slaughters are heartless gangs and criminals. These bad guys even killed village people who wanted to stop them when they were found stealing companion animals in villages. Their monster-like slaughter has sicken me to core and challenged my belief of humanity. As far as I know, Swiss is a country far more developed in animal welfare legislation. But why your people apply such an opposite standard in China? It is a huge disaster to animals and people alike that there is no moral and laws to prevent cruelty and sadistic behavious. Therefore we are struggling for legeslation of anti-cruelty of which to end the dog meat industry is a big concern. Please, I would like to ask you and even beg you not to promote any forms of animal exploitation in China anymore, but help promote “animals right” in my country. Whoever wrote that article in City Weekend is a heartless, soulless idiot. Maybe they were trying to be funny, but there are a lot of people who do not find humor in such a thing.